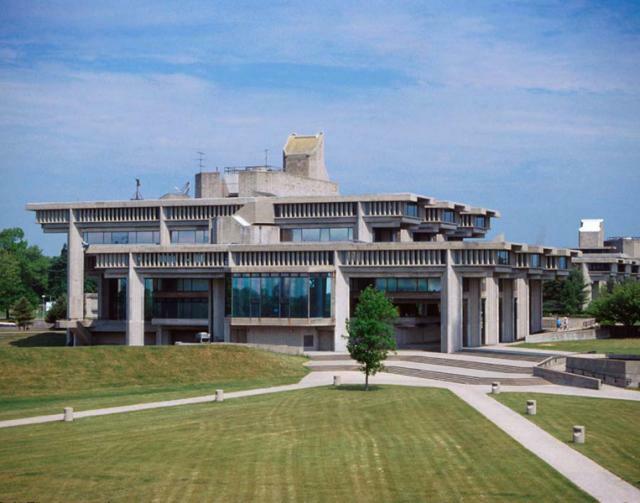 UMass Dartmouth, a public university campus in southeast Massachusetts, was master-planned and designed tabula rasa mostly by Paul Rudolph, the midcentury architect known for his pioneering Brutalist buildings. Now, the university’s College of Visual and Performing Arts (CVPA) is celebrating its founding architect with a six-week-long arts celebration dedicated to Rudolph’s work and legacy. Playing the Campus runs from March 21 to April 28 and is free and open to everyone. To kick off the series, sound artist Andy Graydon will stage To Scale (10,000 things for Mark Tobey) in Rudolph’s Liberal Arts (LARTS) building, while José Rivera and Michael Rosenstein will close the program with Sonic Section Perspectives (For Paul Rudolph), a sound installation presented by Non-Event that collages field recordings made in and around Rudolph’s Boston-area buildings. The piece will be performed in the CVPA building’s central atrium. On April 16, an exhibition featuring the architect’s campus model and original concept drawings for the LARTS building will debut in A Visionary Campus: Paul Rudolph and UMass Dartmouth. Lectures centered on the campus’s Brutalism, as well as a screening of Concretopia, a 2017 film that delves into the campus design, round out the program. More information on Playing the Campus, including the full schedule of events, can be found here.